With every profession there is always that one thing that is frowned upon among your fellow peers. For us in the graphic design circle that something is the use of the comic-sans typeface. 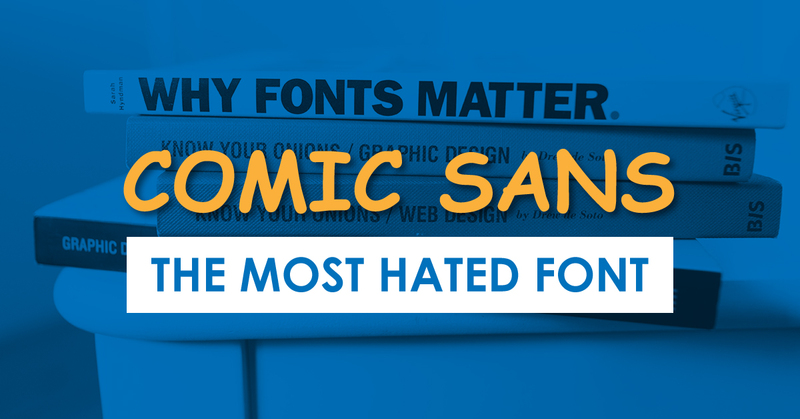 Often referred to as the most “hated font in the world”, comic-sans has become so infamous that there are petitions out there trying to ban the font altogether. But who created this sans serif script font and why do you still see it everywhere? The answer goes back to 1994 when Vincent Connare, working at the time for Microsoft, was employed to create a font for the Microsoft Bob Project. Intended to be used within speech balloons to inform users how to navigate the Windows platform, Vincent set out to create a handwritten font based off of his love for comic books. Due to how far along the Microsoft Bob Project was however, the font wasn’t completed in time and was instead released as a packaged font within the Windows 95 Plus Pack. Accessible to the public in basic programs such as Microsoft Word and Publisher, the font became an instant staple within 90’s culture. Being used in offices and for brands such as Beanie Babies and The Sims, the typeface was showing up everywhere including personal projects by the everyday user. Greeting cards, posters, signs, t-shirts, magazines; countless designs were featuring a font that was never intended to be used for print. According to Tim Slavin, writer for Beans Magazine, the reason why designers hate comic-sans is due to the fact that people use the font with little or no care. Simply put, the typeface was being misused; appearing in corporate presentations and even selected as the font for some official Vatican documents. I feel that the average person is attracted to the comic-sans font due to the fact that it is less intimidating when up against fonts such as Helvetica and Times New Roman. The font has a childlike appearance that could turn the most serious of words into a playful tone. “Using Comic Sans is like turning up to a black-tie event in a clown costume,” co-founder of BanComicSans.com; Holly Combs said in an interview. When designing it is imperative to put thought behind the fonts that you use. Fonts have the power to determine how people should react to your design and they can influence the consumer in a variety of ways, for example; having a law firms stationery typed out in comic-sans doesn’t necessarily come across as professional. So, is there ever a place where comic-sans can be considered acceptable? Of course there is, I feel that in the classroom for grade schoolers is the perfect place for a child-like font. The typeface should be easy to recreate by hand for any young student learning how to write letters for the first time. Upon doing some additional research I discovered that comic-sans is actually the preferred font to help individuals with dyslexia read due to its character disambiguation and variation in letter heights. With thousands of fonts available for free download online, it is easier now than before to make your designs unique with a more acceptable font. Remember, your designs can only be as serious as the font that you use.